When we moved here 12 years ago it was quite odd to me that the name of the town we were now living in was Palmyra, VA. Growing up in Lebanon, PA, most of my aunts and uncles lived in Palmyra, PA, so I thought that intriguing how life comes full circle at times. Then after a short period of time I learned that Gordonsville was only a half hour from our home. My grandfather that raised me was born in Gordonsville. His family lived over in the Shenandoah Valley, but in those days women didn't use hospitals to deliver babies, they delivered at home. I assumed that he was born in Gordonsville because his mother was visiting family as she was about to deliver. I can only speculate and will not know till I get to Heaven and it probably will take hundreds of years for me to come to such a trivial question as this one. Last month we passed through Gordonsville on our way to Orange, VA, so I decided to visit a couple of places for photos and the "feel" of many of these historic places. You have to wonder if the ground wants to cry out for all that has been done on the land. I enjoy architecture more than the interior of homes so I'm happy to gad about outdoors while folks visit historic homes inside. The first stop was The Exchange Hotel Civil War Museum. It's Virginia's only standing Civil War receiving hospital. Sadly the Exchange Hotel only had its first two years to be the grand place it was for folks traveling on the train which ran in front of the house. Grand ladies with hooped skirts and waist-coated gentleman were treated to the sight of the hotel's handsome architecture of wide verandahs and stately columns. The photographs have a lot more historical details in the descriptions, so be sure to view the Exchange Hotel Photo Album. 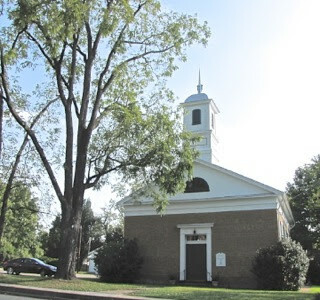 While we were in Gordonsville, we stopped at the oldest church in town, established in 1845: Gordonsville Presbyterian Church at 406 N. Main Street. 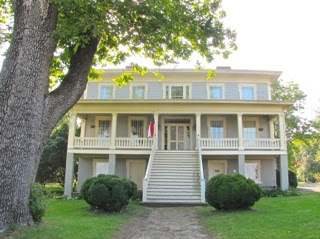 This is where General "Stonewall" Jackson worshipped during the Civil War. His pew is still preserved within the church. Across the street stood the Gordonsville Methodist Church, established in 1873. The photos of the churches are in the Gordonsville, VA - Miscellaneous Photo Album along with a photo of the restored downtown shopping area.